Ever try to take a picture of a window??? No, why would you. But photographing these little beauties is a bit tricky, so bear with me. I couldn't take a front shot because of the glare. This is the Medium Sized Crystal Clear Keepsake Case. There are 3 styles to choose from. This one is the Ornate Fleur. The 4 pieces of acrylic fit into slotted pieces of Masonite. Fill it with anything you like, here I used Frosty Snow that's big enough that it doesn't come through the cracks. But a texture snow could be used as well. The Pine Cones have gold paint on them, but Kristin carries them with white snow. I used a hot glue gun to add the berries and decorative twine to the top. This is a Small Chipboard House.....without the accompanying base,covered in Red and Gold Glitter. There are 2 Snowflake Cut Outs on the roof with White Art Sugar Glitter....Boy is that stuff gorgeous! The little Snowman rolling a a snowball is a mini ornament from Hobby Lobby. I glued all of them down with 3D Matte Gel...stuff really works great. The Green Glitter on the top is sealed. Aunt Peaches and her I Love to Create.com blog. I adapted it with the products I had. You mix 1 part water, 1 part Soft Matte Gel, and some fine glitter of the same color. 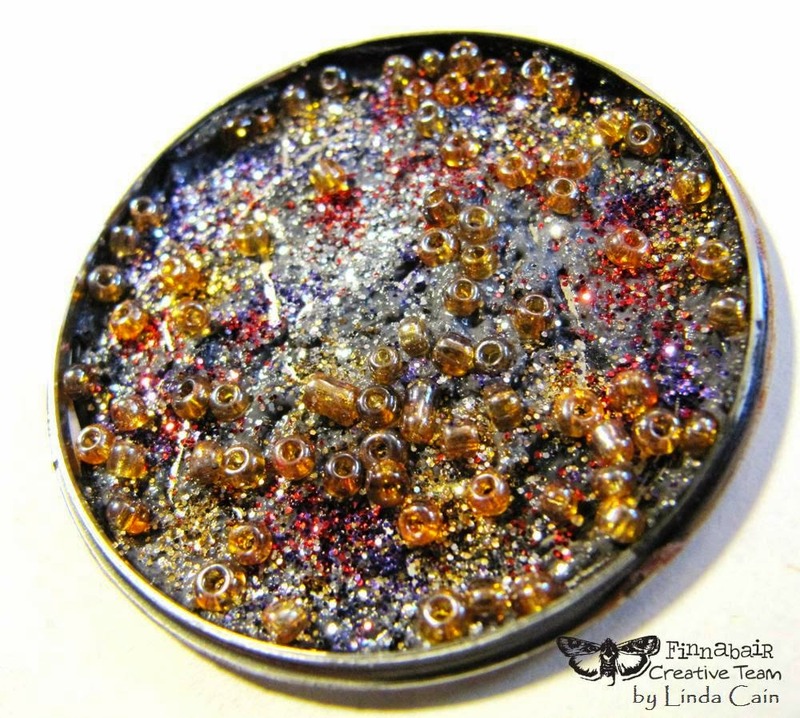 After your original layer of glitter is completely dry, paint a thin layer of the above mixture over the surface. I was really apprehensive of this, thinking it would loose the "shine", but it was amazing how it just seals the glitter so no more falls off! Brilliant! So check out the links below, ask me questions, leave comments, whatever!!! Just have some fun and get "glittery!" Retro Cafe Art Gallery Products: Crystal-Clear-Keepsake-Case--Ornate-Fleur, Mini Frosted Pinecones with Berries, 1.5-Inch-Green-Bottle-Brush-Trees-WITH-SNOW, 1-Inch-Green-Bottle-Brush-Trees-WITH-SNOW, Snowflake-Cut-Outs, Small Chipboard Houses, Soft Matte Gel, Heavy White Gesso, 3D Matte Gel, Glossy Accents. Other Products, Ice Stickles Christmas Red, Mini Snowman Ornament, Red and Gold Trim, Frosty Snow, Gold Tinsel Twine, Ebony and Ivory- Mardi Gras,-and Luminous Glitter Sets by Finnabair, White Art Sugar, Hot Glue. So let's have a tutorial! I've had this bottle for several weeks....just sitting on my work table....calling my name. 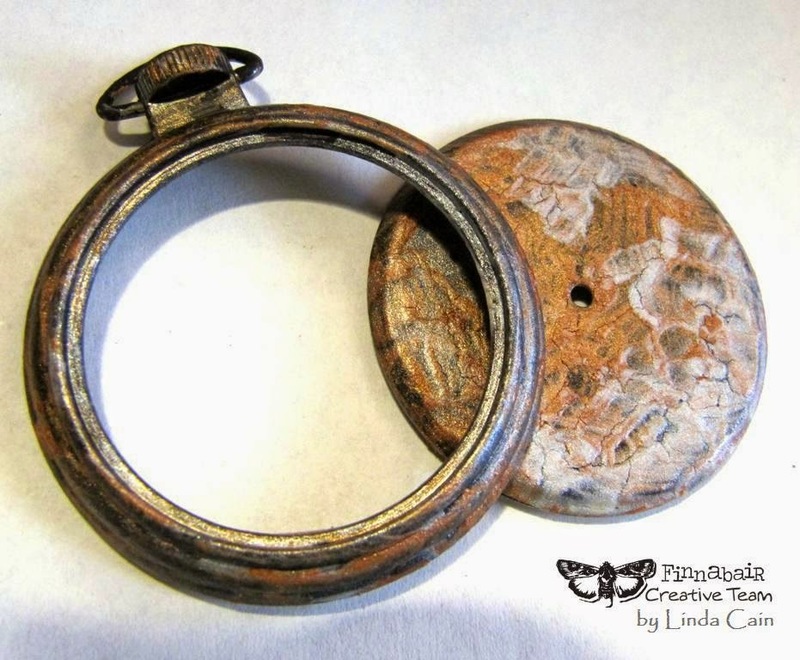 Finnabair-Art Basics, Art Extravagances, and Art Ingredients. I started with a glass stoppered bottle from Hobby Lobby that I coated with Soft Gloss Gel. When dry, I added a coat of Clear Texture Crackle. The heavier the layer, the larger the cracks. Here I found you need a thinner layer to dry clear enough for light to come through. I added a 2nd coat when it was dry. When the bottle was dry, I added layers of Distress Inks in browns, oranges and black soot. Then I dry-brushed Soft Matte Gel in areas and covered them with Charcoal Art Sugar. I really think this turned out cool! Kind of hated to cover it up!!! This was done with a bit darker colors of ink on a Jelly Jar to hold some colored pencils. A good test project. A button was glued into a medium gold Bottle Cap that was then glued into a medium sized Pendant Cap using 3D Gloss Gel. I used a jewelry tool to roll the edges of the Cap when it was done drying. I added Soft Gel into the button background and sprinkled a gorgeous Blue/Black Glitter from the Ebony and Ivory Collection into it. The Tassel was trimmed a bit and loaded up with some Gold and Black Glitter. 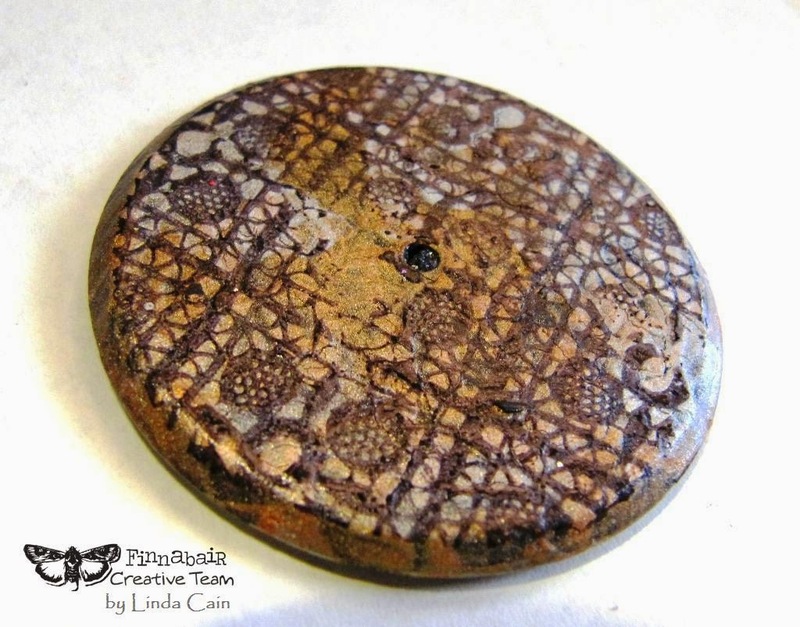 The glass stopper was painted with Heavy Black Gesso first, then a layer of Copper Crackle Paste. Here you see it before it dries. It's a thinner coating here so as to let the Black Gesso show through in spots. This starts out as a Mechanical Flowerx10. I used jewelry snips to remove every-other section in the round metal piece. Carefully bend the Mechanical over the top of the stopper and glue with 3D Gel. I added some vintage trim with 3D Gel and Say It With Pearls from Prima. Cut the page in half and add some to the back and front sections of the bottle. I used a Rose Mechanical with the Ebony and Ivory Glitter again to adorn the top. A large clear Rhinestone is added to the center of the flower and glued to the stopper with 3D Gel. A second layer of decorative ribbon is added to the bottom and the neck of the bottle. 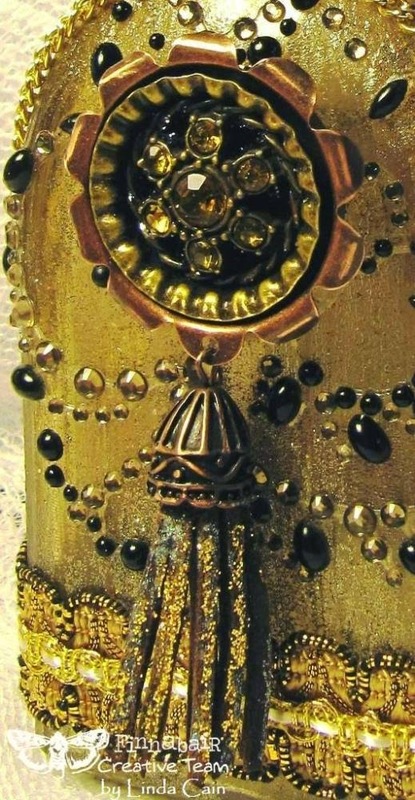 The Gold Chain is looped over and criss-crossed at the top for just a bit more glitz.I really think it added a lot to the bottle. 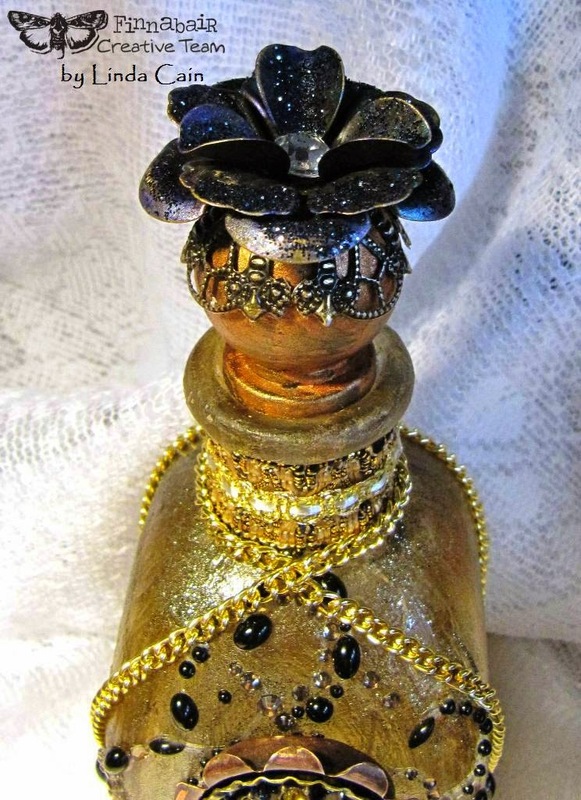 So get out your art supplies, check out the links below, grab an old bottle, and have fun decorating it!!! A great Holiday gift for a special friend...perhaps. Soft Gloss Gel-961435, 3D Gloss Gel-961381, Texture Paste Clear Crackle-961541, Texture Paste Copper Crackle-961534, Heavy Black Gesso-961459, Charcoal Art Sugar-961794, Glitter Set Ebony and Ivory-961602, Glitter Set Luminous-961596, Say It With Pearls Black-535797. Finnabair Mechanicals Used: Tassel-961114, Bottle Cap, Pendant Cap-961091, Flowers x10-960407, Roses-960339. 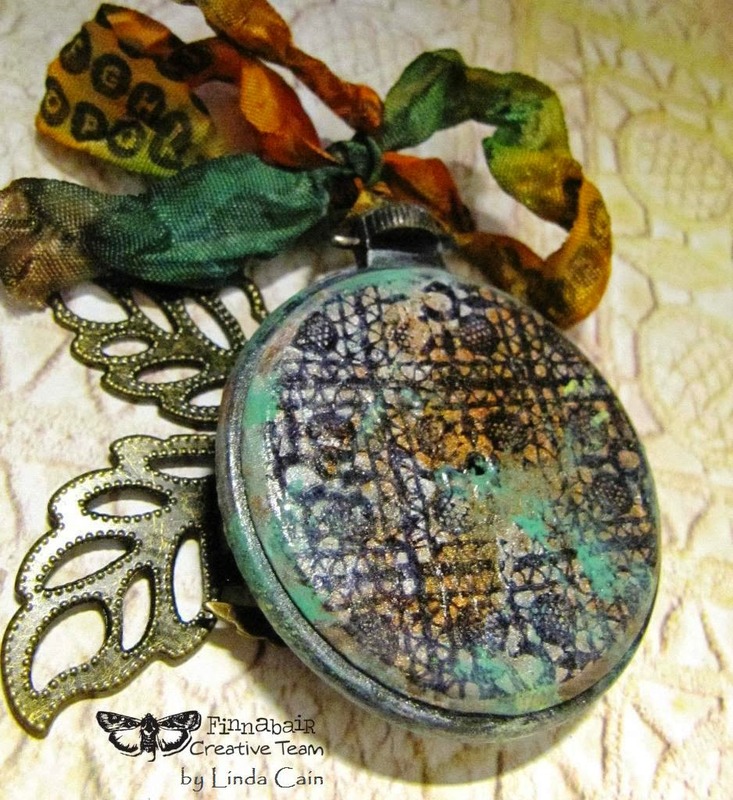 Other Products Used: Distress Inks- Spiced Marmalade, Vintage Photo, Tea Dye, and Black Soot. It's that time of year again. Time to get out the glitter and paints and make a little treasure. Soooooooooooooo sweet! And she's only 4 inches high. Perfect for your tree. The Jingle Bells and her Halo are in the shop, as well as the Paper Clay and Art Doll Face Mold that I used here. Check out the site and order a few to make for the Season. Products Used from Retro Cafe Art Gallery: Primitive Angel Art Doll Kit 6, Sunburst Halo Cut Outs, Heavy White Gesso, White Art Sugar, Platinum Glass Glitter, Creative Paper Clay, Art Doll Face Mold, Mini Glitter Jingle Bells. Other Products Used: Fresco Paints, Finnabair-Luminous Glitter Set and Soft Gloss Gel, Coffee Archival Ink, Finnabair Stamp Set, Gold Ric-Rac, Pens, Wire, Gold Cord. 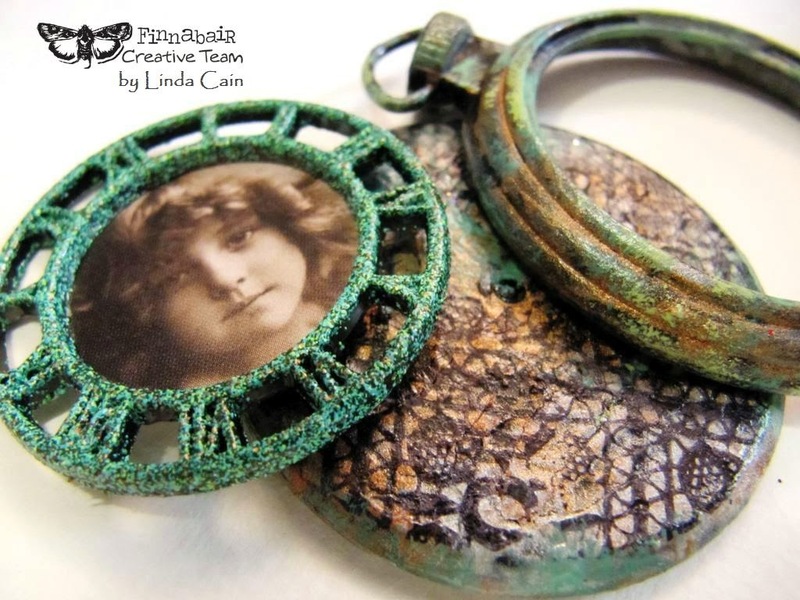 The Finnabair Creative Team has a few projects over on the Prima Blog today. We're showcasing the Art Extravagance products. They include Texture Pastes and Crackles. I think you're gonna love these products. I popped the back off the Clock/Pocket Watch and painted the entire thing with Heavy Black Gesso. Then I added Platinum and Copper Crackle Texture Paste. Using Black Archival Ink and the Sunrise Sunset Stamp#3 set I stamped the back. I wanted a worn and vintage look so I didn't use an acrylic block, I just pressed the inked stamp gently leaving areas unstamped. I spread a layer of Graphite Texture Paste into the back of the Clock and ran a tool through it creating a pattern. Then I sprinkled 3 shades of Glitter around and added the Plum Glass Beads. Let this dry. The Small Clock Face is pushed into clear embossing ink and embossed with Verdigris Embossing Powder. Next I mixed 2 shades of paint to get the same color of turquoise, then I added it to the back in spots with a sponge. The front of the clock has Copper and Platinum Texture Crackle randomly painted around. When it dried, I added some of the paint to break up the color. Both pieces were sealed with Soft Gloss Gel for a nice shiny finish. 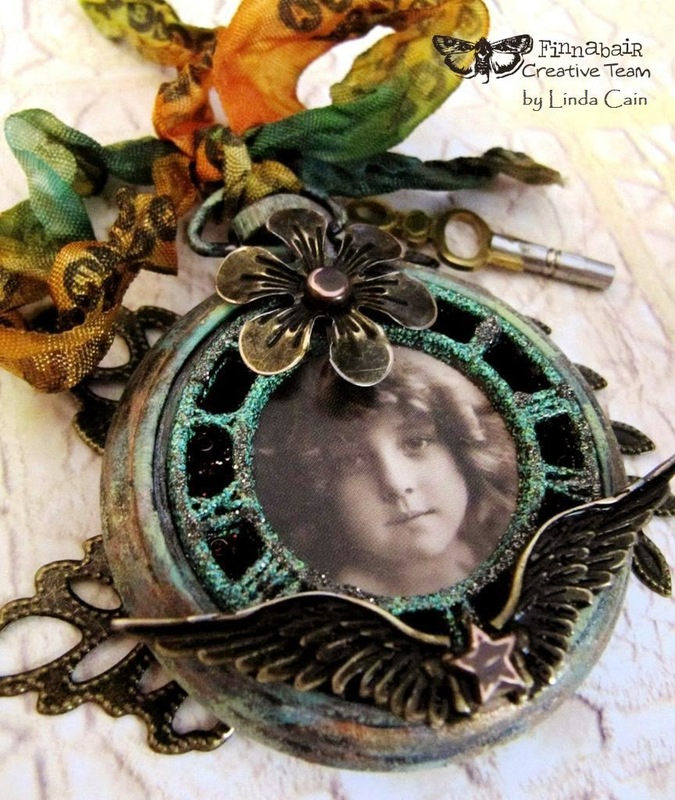 Cut out the Vintage photo of the girl and glue to the Clock Face. The Crinkle Ribbon was colored with Distress Inks and stamped with the Sunrise Sunset#2 stamp. I used a Mini Flower, the Wings and a Star Brad to decorate the front. I broke up the color of the clock face with some Charcoal Art Sugar that I added with Soft Gel. Glue you pieces together with 3D Matt Gel...it really works great! 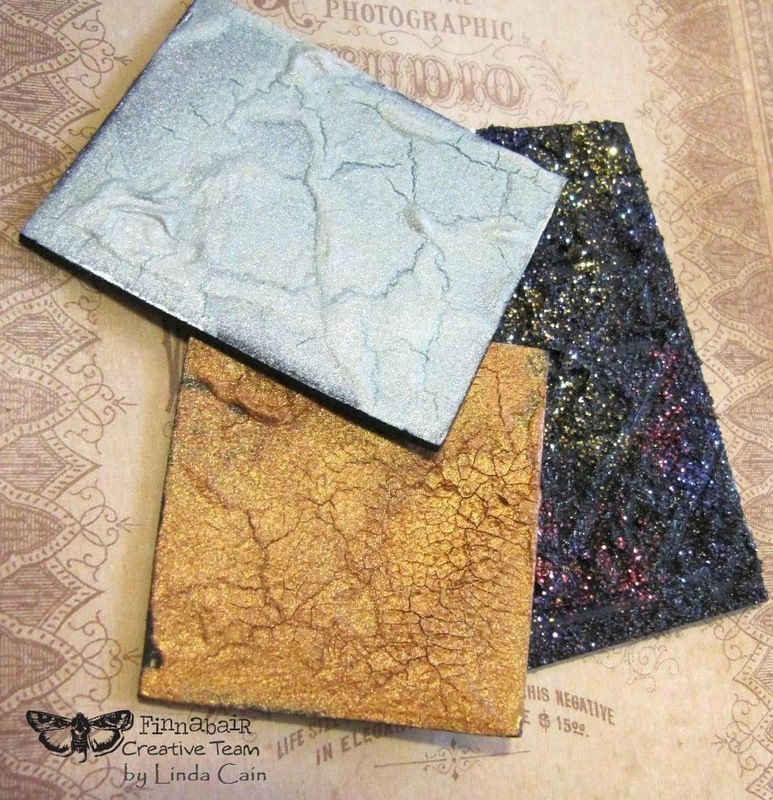 This is just my 3 samples of the Texture Pastes...the Platinum, the Copper and the Graphite with the Glitter added. I used Distress Inks on the Crackle when dry for a richer color. Hope you enjoyed this step-out. As always, ask questions and let me know what you're up to! Prima Products Used: Mechanicals Clock-961084, Mechanicals Small Clock Face-960278, Mechanicals Star Brads-961169, Mechanicals Mini Flowers-960322, Copper Texture Paste Crackle-961534, Platinum Texture Crackle Paste-961527, Graphite Texture Paste-961497, Heavy Black Gesso-961459, Glass Beads Plum-961718, 3D Matte Gel-961398, Soft Gloss Gel-961435, Art Sugar Charcoal-961794, Glitter Crimson-961589, Glitter Luminous-961596, Glitter Mardi Gras-961572, Junkyard Findings Steampunk Air-892289, Sunrise Sunset Stamp#3, Sunrise Sunset Stamp#2. 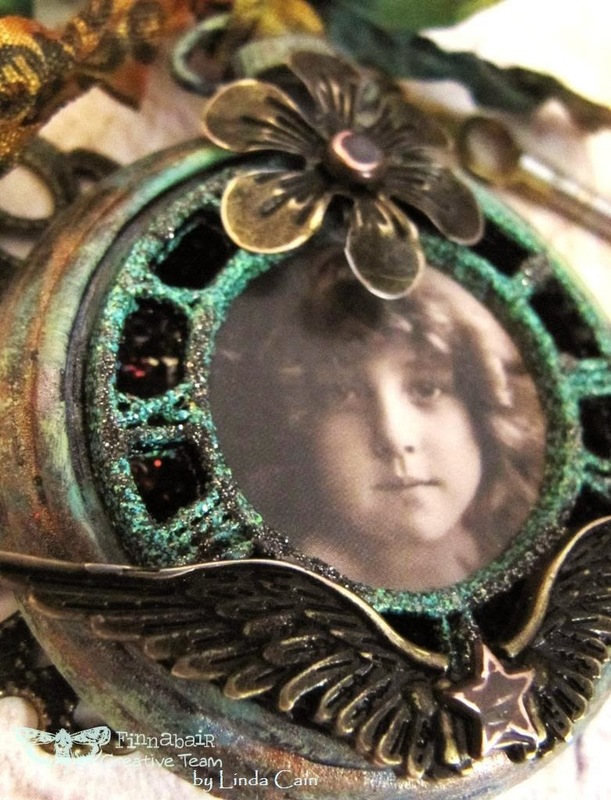 Other Products: Vintage Photo, Jet Black Archival Ink, Vintage Picture, Crinkle Ribbon, Distress Inks, Acrylic Paints, Embossing Ink, Verdigris Embossing Powder and a Copper Brad.